Top the search engines, part 3! For the last week we have talked through how you can buy your way to the top of the search engines results with Pay-per-Click (PPC) marketing. The first requirement on our list for a successful PPC campaign was to first calculate the “Marginal Profit” you can expect from the type of new patient you want, and then your Return on Investment (ROI). We demonstrated how to calculate your marginal profit on new patient. In our example the marginal profit of a new Cosmetic / Restorative dental patient, is about $4,000. This means that if you spend $2,000 on an Internet PPC marketing campaign to generate one additional new cosmetic patient, with a gross production value of $5,500 and a net contribution/marginal profit of $4,000, your ROI is $2,000. For those still here, the second step to generating gobs of new patients from PPC marketing is to know how much you can afford to pay per “click,” which is to say for each visitor that visits your Web site. Each of the three major search engines – Yahoo, Google and Microsoft – have their own PPC marketing programs. But before you start, you need to know what the target “keyword” marketing phrase is for your ideal high-value new patient. In other words, know which keywords you actually want to bid on, the keywords being the phrases a Web user would actually need to type into Google or the like to view your ad. Consumers searching for the term “Cosmetic Dentistry” are looking for information so they can make a decision. If your Web site has tons of information on cosmetic dental procedures, then you may have a chance here. Otherwise, I strongly suggest you stick to “Cosmetic Dentist.” People who specify “Dentist” are generally looking to buy now. Now, unless you are “The Dentist to The Stars,” (I know of a least seven doctors using that tag line) and expect people to fly from every state and province to your practice in Iowa, “Cosmetic Dentist” alone just simply isn’t enough. People from across North America are going to be seeing your ad. You are going to be paying up to $2.00 a click for the privilege of having them visit your Web site, yawn and leave because they don’t know where Iowa is. This is a quick trip to marketing/financial suicide. Instead, use the term “Cosmetic Dentist” in combination with your local geographical market – “Cosmetic Dentist San Francisco,” “Cosmetic Dentist Peoria,” “Cosmetic Dentist Burbank,” etc. People want a dentist that is geographically close to home. Each search engine has a different way of calculating the price for the same “Keyword” phrase for your target market, so you will have to visit each of their sites to determine your cost-per-click. 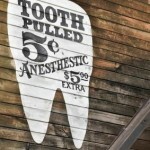 For the search term “San Francisco Cosmetic Dentist” on Yahoo, for instance, the cost of is about $10.00 a click. With a gross production value of $5,500, a net contribution/marginal profit of $4,000 and a desired profit of $2,000, you could afford to spend $2,000 to acquire a cosmetic patient. At $10.00 a click, that’s 200 visitors to your website. Normally, I would say that was a “No-Brainer” marketing decision. Out of 200 visitors, you should be able to convert at least one to an appointment request, and then into an actual appointment. Unfortunately, that is not the norm for the average dental website. The sad truth is that 90% of the dental websites on the Internet are so lame that they don’t even provide a simple way for a patient to request an appointment. What’s more, up to 50% of all new patient appointment requests are lost at the front desk due to poor call handling. We will deal with the conversion problem next time.